Jamie Whincup says a conservative approach to fuel strategy cost the Red Bull Holden Racing Team victory in Race 22 of the season at the Vodafone Gold Coast 600. 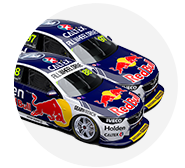 The Triple Eight entries locked out the top three places on the grid and showed the way for the first half of the race, but were leapfrogged by Scott McLaughlin at the second stops. McLaughlin, whose car rose from 13th on the grid thanks to a strong opening stint from Alex Premat, pitted four laps earlier than Whincup, the undercut proving beneficial. Second allowed Whincup to take the points lead from Fabian Coulthard with two events remaining, leaving the six-time champion with mixed feelings from the day. “We gave it everything but we were just a bit conservative. 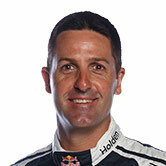 We finished with too much fuel, we stayed out a bit too long at the end,” said Whincup. “The other boys took more of a risk and got rewarded for it. I can’t do any more than congratulate them. “I don’t want to say too much, but we probably stuck on our strategy [when McLaughlin pitted] and we probably should have changed it up and been more aggressive. Whincup emerged from the pitlane as McLaughlin was entering the first chicane, with the Ford driver choosing to shortcut the corner to avoid a potential collision. McLaughlin’s decision negated any chance of Whincup using the momentum from the pit exit line to retake the place at the following corner. Whincup cut the beach chicane later in his outlap and, keeping his position, neither of the two shortcuts resulted in a penalty. “I just went as hard as I could and he went through [the chicane] which means I didn’t have an opportunity to pass,” said Whincup, who refused to blame the issue for the result. Whincup now heads the championship for the first time this season, 17 points ahead of erstwhile leader Coulthard, with Scott McLaughlin a further 10 back in third.